We are selling T-Shirts for our Weekend of Service 2017. Please fill out this form if you would like to buy a T-Shirt. T-Shirts are $10 and orders will be placed NO LATER than Wednesday, August 2. Payment for t-shirts can be made by credit card on this form or can also be collected in the church office by cash or check. 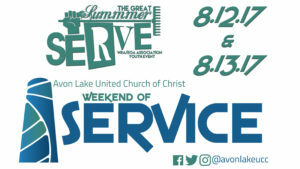 Please make checks payable to Avon Lake UCC. If selecting the option to “pay later” please remember to bring payment to the church no later than August 2 or your order may not be fulfilled. View the t-shirt color choices here.